In this 21st century, we have experienced tremendous changes, which have affected the financial, technology, business, and educational markets. Since the inception of cryptocurrency, new opportunities have continued to unfold and taking advantage of these opportunities to change trends and build on innovation shouldn’t be taken for granted. To help teachers, we have decided to use the Blockchain as a profitable tool to assist teachers, who have contributed greatly to the world. Our platform is aimed at helping teachers plan for retirement, sharing specialist resources, and storing professional lesson plans for them. We understand the important role teachers play in the world, which is why we decided to value and support them. Our team comprises of educators, administrators, managers, and leaders, with more than 25 years’ experience in the educational industry. How Does Teacher Coin work? Teacher Coin (TCH) takes advantage of the digital and verifiable feature of the blockchain to solve complications teachers face. Furthermore, it will disrupt the entry barriers to the retirement market by eliminating the fine print. Interestingly, we have removed the complex and confusing terminologies used by many financial institutions to deceive investors through our TCH Smart Contracts. In simple terms, the TCH Smart Contract contains the contract, amount of investment, years, and payment structure. Through our blockchain-based TCH Smart Contracts, we offer transparency and accountability in such a way that no other technology has offered. Through the combination of anonymity, decentralized encryption, immutability, and the Teacher Coin, we will generate the ultimate platform for the education industry that will provide educational support and secure retirement packages for all educators in the world. Teacher Coin (TCH) has partnered with Pacific Prime to arrange a personalized insurance package specifically tailored to the needs of teachers and administrators around the globe providing them with world class Health Insurance. Our aim of developing the Teacher Coin is to provide an easy to understand, a low cost, and a transparent package for educators. The platform gives them the opportunity to buy and sell high-quality educational resources using a simple and transparent mechanism. The retirement aspect of the platform will modernize how things are done in our current retirement industry. Our platform will make retirement fully verifiable because it is built on a system of trust between retirement advisors and teachers. Furthermore, we know that the blockchain technology holds an immutable ledger and contacts, which can accommodate the storing and recording of all Teacher Coin retirement contracts easily. Teacher Coin is the first company designed to leverage the smart contracts by creating a retirement system for teachers throughout the world using the blockchain. The TCH is the token that powers and incentivizes the users in the Teacher Coin community. You can use the TCH to exchange other fiat currencies such as EUR, USD, and JPY as long as it is within the jurisdictions where such exchange is legal. Additionally, you can exchange it with other cryptocurrencies such as Ripple, Ether, and Bitcoin. The expected value of 1TCH is equivalent to 0.05USD. The maximum supply of the Teacher Coin will be 500,000,000 after which there won’t be any further production of the TCH tokens. The token is created using the ERC-20 Token smart contract. As part of our way of ensuring that our dream is realized, we have started trading TCH on the Token Store, where its current value is about $0.00004601. To ensure effective competition against other tokens and coins, our energetic team is working around the clock to ensure that the token is listed on other world class exchanges before the year runs out. 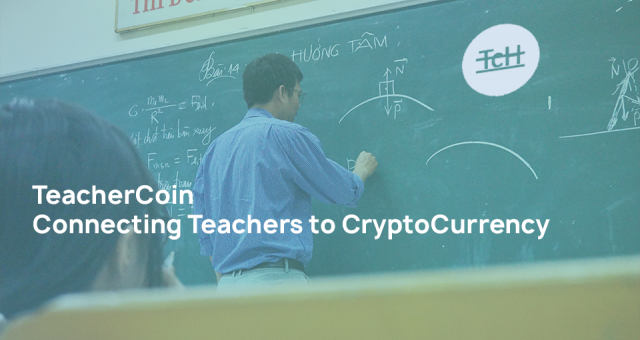 The Teacher Coin seeks to reform, modify, and innovate the educational industry by offering a specifically tailored cryptocurrency for teachers. The TCH is a utility token, which affords teachers the opportunity to invest in any retirement package that suits them while selling and buying resources globally. We have designed a unique platform to give to the teachers, who have dedicated their lives to this noble profession to shape the future and character of our children. Teachers ignite imagination, arouse hope, and install a love for learning. The Teacher coin platform is giving back to teachers to help them succeed in their quest.